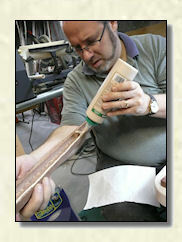 My friend Jirka came over to my shop in November 2008 and I showed him how I make my flutes. The sessions lasted a couple of days and resulted in 4 Lacewood flutes. Two were finished during the sessions — one for Jirka and one for myself. Two were finished shortly after. I gifted one of those to my best friend Karl and the other one was sent in a flute exchange to Michael Farmer. 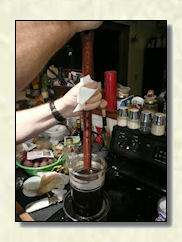 Jirka was kind enough to take pictures of the process. Most of the time I start with stock boards, 1 inch in this case. 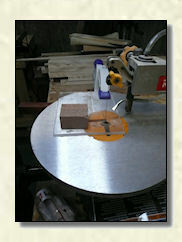 These pictures were taken before I acquired my band saw, so I used my table saw to cut the blanks to size. 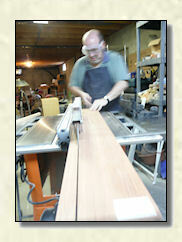 First they are cut to the correct width and then they are rotated 90 degrees and cut to the proper thickness. These steps are now done with my band saw. Next they are cut to to length. 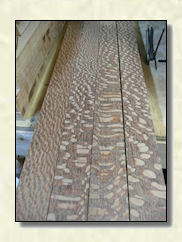 After the blanks have been cut to size, they are routed out. 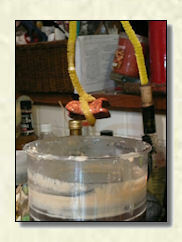 This forms the SAC (slow air chamber), main bore, nest and flue. The nest and flue are visible in the last picture in this section and look like concentric elipsis. 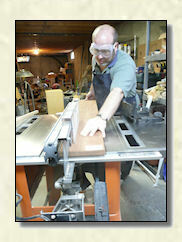 I custom built the router table specifically for routing flute blanks and have since updated it to a much simpler design. I prefer to route my blanks using a plunge router rather than using a table with a fixed router as it gives me better control. 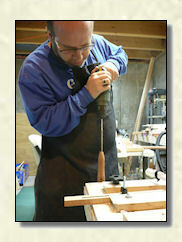 Three separate router bits are used. A roundnose bit for the SAC and main bore, a straight flat bottom bit for the nest and a smaller straight flat bottom bit for the flue. I route the flue a little bit deeper than it will end up in the finshed flute so that the nest can be re-flattened after turning on the lathe. 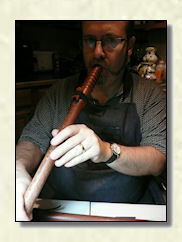 The mouth end of the flute is left solid at this point. The mouth opening will be added in a later step. I prefer to do the major roughing in of the SAC Exit and the TSH (True Sound Hole) areas before glueing the to blank halves together. I use a combination of a dremel Stylus with an 1/8 inch straight high speed cutting bit and a set of small files. I get these areas close to their final form, but try not to over work them as the exact height of the nest will not be determined until after the flute has been turned on the lathe. Once I am satisfied with the SAC Exit and TSH, it's time to glue the blanks together. I use Tightbond III glue because it is strong, waterproof, non-toxic and has good working time before it dries. I use quite a few clamps to get a nice tight seam. 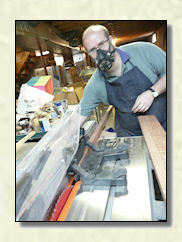 The bird or block is simply a small flat bottomed piece of wood that forms a roof over the flue. 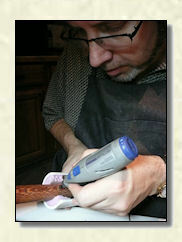 I use a scroll saw and belt sander to shape my birds. 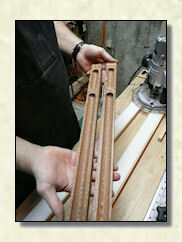 When I first started making flutes, I worked mostly in cedar and hand planed them. 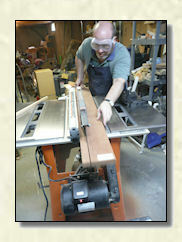 Since then I have become alergic to cedar and work mostly in hardwoods now. 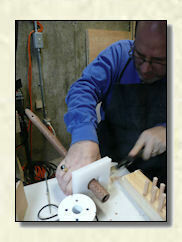 I also switched to turning my flutes on a lathe. 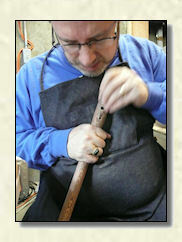 Before the flute is mounted on the lathe, I use a 3/8 inch auger bit to mark the position where the mouth opening will be drilled. 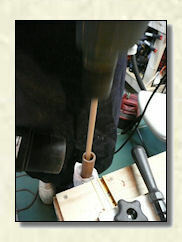 This is then used as a mounting point for the tail stock of the lathe. 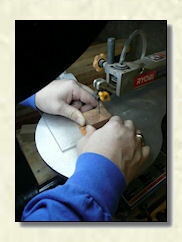 I use a roughing gouge for the major work and a skew chisle to form the tapered mouth piece. 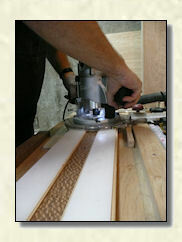 A small bowl sanding attachment with various grits of sandpaper smooth things out and remove any tool marks. 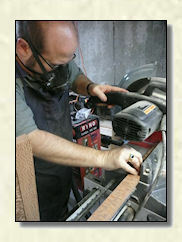 I run the drill in reverse to counteract the rotating motion provided by the lathe during sanding. 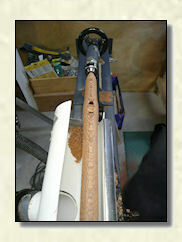 After the flute has been turned, I use the same 3/8 inch auger bit to finish boring the mouth opening. 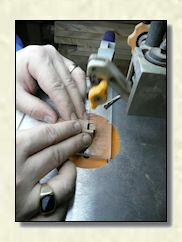 This process creates a perfectly symetrical mouth end of the flute. 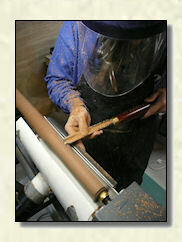 I then sand the inside of the bore using sandpaper wrapped on the end of a wooden dowel. Before the blanks were glued together, I roughed in the TSH and the ramp under the cutting edge. Now it's time to fine tune this and establish the initial voice of the flute. Later on I will come back and fine tune the voice until I'm happy with it. The fundamental or lowest note of the flute is derived from the length of the main bore. 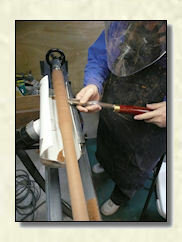 The flute starts out longer than needed and the length is trimmed to raise the pitch of the fundamental note until it is correct. Before I begin placing and tuning the fingerholes, I dip the mouth end of the flute in the beeswax/mineral oil finish for 6 minutes. 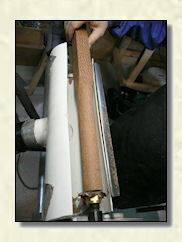 This prevents the flute from absorbing too much moisture during the tuning process. 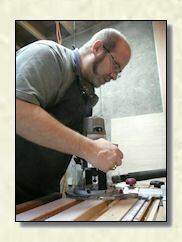 Then it is time to layout the fingerholes and tune them. 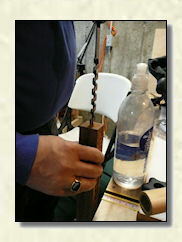 I use two high speed cutter bits for this: A 1/4 inch cone shape bit and an 1/8 inch straight bit. I have these mounted in two Dremel Stylus tools so that I can move back and forth between the two quickly. I run the bits at high speed which causes them to burn as much as cut into the wood. The cone bit is used to create an initial depression so that the straight bit does not wander. 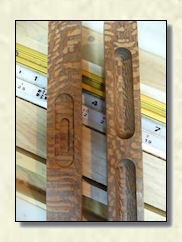 All the fingerholes start out 1/8 inch in size and are widened to bring them into tune. 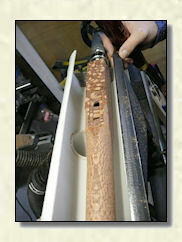 The small size of the initial holes, allows them to be shifted north or south on the main bore during the widening process which provides a certain amount of control over the size of the final holes (as a hole is moved south toward the foot of the flute it needs to be widened to maintain the same note). The white plastic piece you see in the pictures is an attachment I made for my mini shop vac. 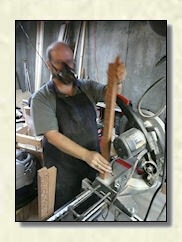 It allows the smoke and sawdust to be collected before it gets into the air. 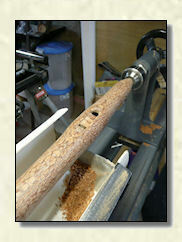 Once all the fingerholes have been tuned, the flute is dipped in the beeswax/mineral oil finish again for 6 minutes. 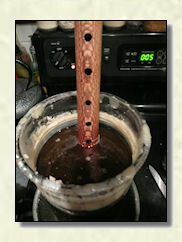 Becuase the flute is longer than the dip tank, one end is dipped and then the flute is flipped and the other end is dipped. Excess finish is wiped off using paper towels. The bird is also dipped in the finish. 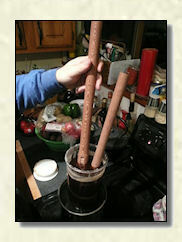 I now have a 31 inch tall stainless steel dip tank that I use. The tank in the pictures is only about 13 inches tall.